Here is a list of 10 free file encryption software that’ll help you to encrypt your confidential data with password protection in order to secure your private files from unauthorized access. If you’re struggling hard to find the apt file encryption tools, then your search ends here! I’ve reviewed some free file encryption software which will enable you to encrypt/decrypt your files with ease. These free file encryption software offer you various features like create self-extracting executable files, apply a key file, compress data, and many more. Some of these tools let you save passwords in history list, hard disk drive, or external storage media, so that you can recover them instantly. Below I’ve reviewed Sophos Free Encryption, Cipher0z, Free File Camouflage, iDoo File Encryption Free, File Encryption, AES Crypt, Cryptography Studio, Conjurers Encrypter 4, Ghost Puzzle, and Conceal. Go through the brief review and grab the desired free file encryption software to protect your files from unwanted access. Sophos Free Encryption is a free file encryption software that lets you secure your data with password encryption facility. This file encryption software lets you add multiple files and does not limit you with number of items. To encrypt your files and other data, simply add files by using methods like “drag and drop”, “folder view”, or “file browser”, to its interface and then specify a target for the archive, and then assign a password to it. You can also create or extract a secure archive, simply by right-clicking on the files. It provides you various features, like, lets you create self-extracting executable files, apply a key file, compress data, and save passwords in history list. This file encryption software lets you share your confidential data, private files, and other sensitive information. It supports various email clients and lets you send encrypted archives via email. It simplifies the handling process as it comprises of features like self-extracting archive, password vault, and scripting for process automation. In order to handle passwords on archive, you can make use of SafeGuard Enterprise’s keyring facility. This file encryption software supports numerous languages namely: English, Spanish, Italian, Japanese, Dutch, French, Chinese and Korean. 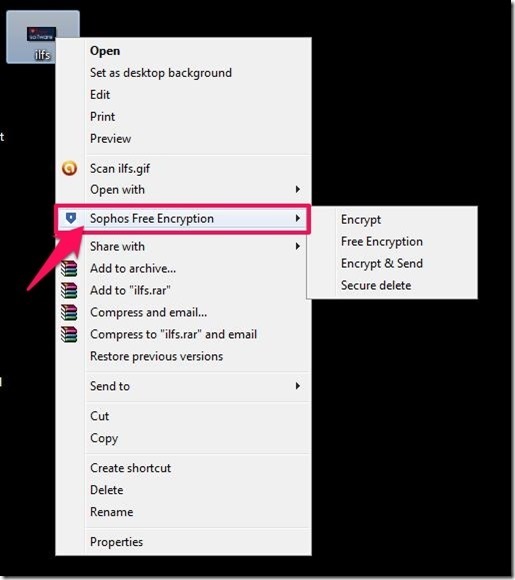 Grab Sophos Free Encryption from here! Cipher0z is a free portable file encryption software that lets you encrypt text and text files and allows you to protect the same with the help of password. As this file encryption software uses AES encryption method, you can easily secure your text files containing sensitive and confidential data. All you have to do is, simply load your text or the text file and enter a password or a private key, and you are done. The only drawback of this file encryption software is that it cannot replace the encrypted file with the original file after decryption and displays just the original text file contents. 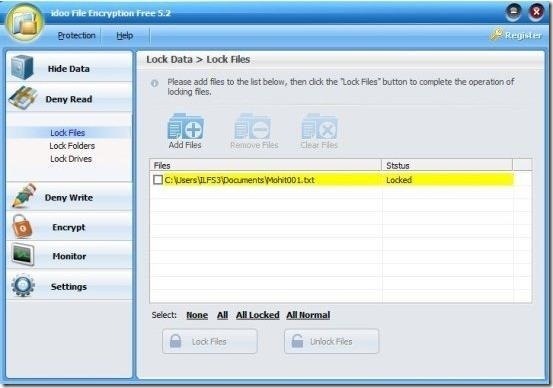 Install this free file encryption software to encrypt text and text files. 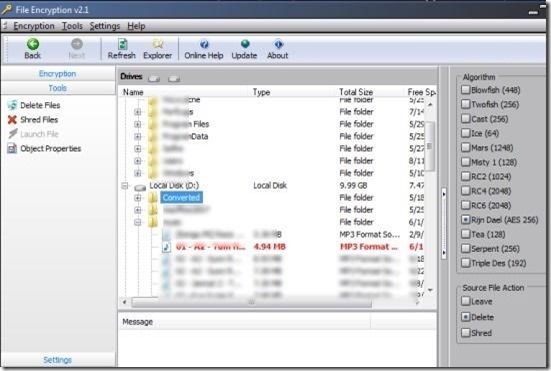 Free File Camouflage is a free file encryption software that lets you hide all your sensitive data and other confidential data beneath a JPEG image file. This file encryption software hides your private files in such a way that it becomes impossible for the prying eyes to find them. It provides you the facility to password protect your files. Not only that, camouflaged file can be send via email, and can be read only by those who knows the password of the encrypted file. In order to hide your confidential data, you have to browse the file which is to be hidden, and then browse a JPEG image file in which you wish to hide, then type a password, and finally hit “Camouflage”. You can also perform the action of encryption or decryption, simply by right-clicking on the file. Hiding confidential data under an image is one of the best way to protect your files from the prying eyes, they’ll be able to see only the image and wont be able to get anything else out of it. Grab Free File Camouflage from here! iDoo File Encryption Free is a free file encryption software that lets you to protect your confidential files with passwords. This file encryption software lets you lock, hide, and protect files with ease. It supports doc, docx, MS Word, Excel, Powerpoint, etc. 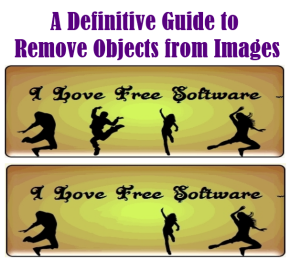 and in addition, it also supports various image files like JPEG, PNG, JPG, BMP, TIFF, and many more. 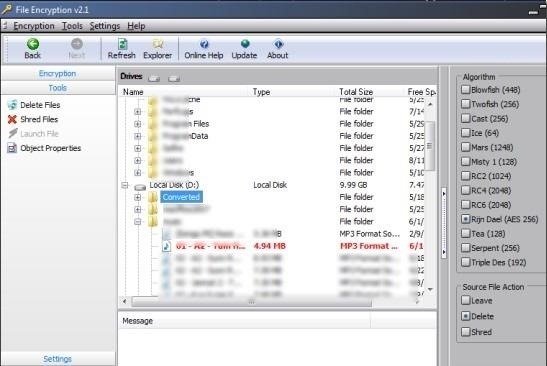 It provides you the facility to encrypt files via context menu and lets you encrypt files either as a copy or as .exe file. All these features are available in free version, you can upgrade to pro edition to get rich featured encryption facility, which offers you folder encryption, hide folder, disk, lock and protect single file, batch files add, and much more. Grab iDoo File Encryption Free from here! File Encryption is a free file encryption software that allows you to select your confidential folders and lets you encrypt files with desired passwords. It lets you encrypt any file type which can be text files, documents, media files, or the entire folder. This file encryption software offers you various encrypting algorithms like blowfish, misty, twofish, serpent, mars, cast, etc., which you can choose accordingly to protect your files on the PC so no unauthorized person can access your private data. It lets you delete and shred unwanted files, so that you can remove them permanently. In addition, this free file encryption software lets you set master password, in order to lock the File encryption to be sure that your data is secured and protected. 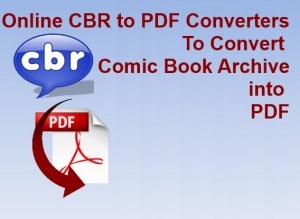 Grab File Encryption from here! AES Crypt is a free file encryption software that lets you encrypt your personal files from the context menu, in order to protect them from any unauthorized access. 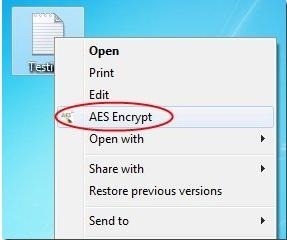 All you have to do is, choose the file that you wish to protect, and using the context menu select AES Encrypt option, then simply create a password. In a few seconds, your file will be encrypted and a new file will be generated as ‘.aes’ extension with password security. Install this free file encryption software to quickly encrypt/decrypt files with password security. Grab AES Crypt from here! Cryptography Studio is a free file encryption software that lets you easily encrypt/decrypt files with password protection. This free file encryption software offers you various hash algorithms like SHA1, SHA384, SHA256, and SHA512 hash algorithms, which you can choose according to your convenience, in order to protect your confidential data. The best part of this encryption tool is that, at the time of decryption, it becomes necessary to enter the details which were provided during encryption, as this procedure ensures security of the confidential data. Grab Cryptography Studio from here! Conjurers Encrypter 4 is a free file encryption software that lets you encrypt your files and folders, in order to prevent any authorized access of the private and confidential data. This free file encryption software lets you encrypt various types of files, which can be text files, media files, images, documents, setup files, and much more. The best part of this encryption tool is that it lets you create a backup of the encrypted files of any desired name in *.bak format. This features proves helpful when you’ve accidentally deleted the encrypted file. Grab Conjurers Encrypter 4 from here! Ghost Puzzle is a free file encryption software that lets you encrypt and decrypt files along with password protect, so as to ensure your private data is protected from unwanted persons. To encrypt desired number of files, you can simply drag and drop them into the interface and assign a password to encrypt your file successfully. It offers you various customization options like create menu in context menu, start application on Windows start up, and many more, which you can use to set your preferences accordingly. Grab Ghost Puzzle from here! 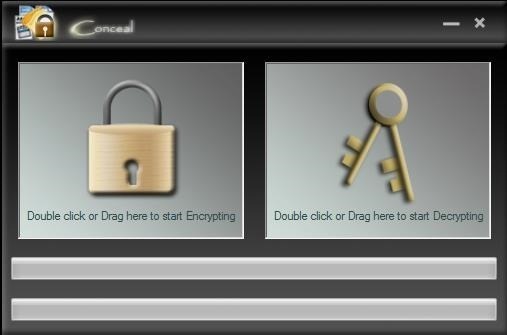 Conceal is a free file encryption software that lets you encrypt and decrypt files by drag and drop procedure. 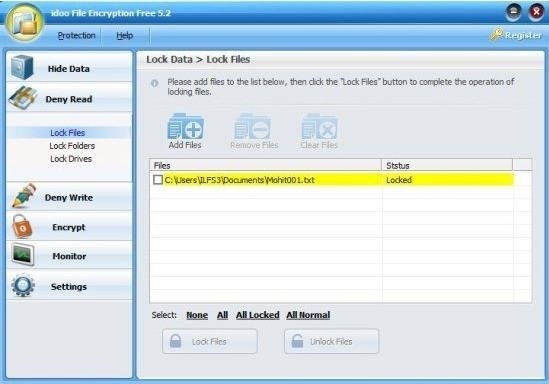 This free file encryption software provides you 4 encryption options like Fast Encrypt, AES, RC2 Encryption, and TripleDES, which you can choose according to your requirement. Simply drag the desired file into the Encryption section and assign a password along with the destination path where you can save your encrypted files. 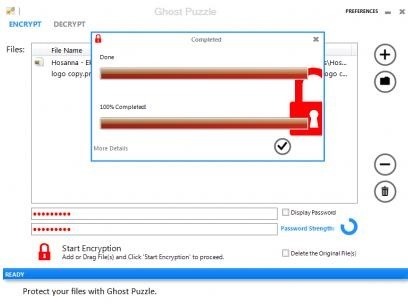 If you’ve created numerous encrypted files using this free file encryption software and often forget your passwords, then this tool offers you a feature where you can save your passwords either on your hard disk drive or external storage media. All you have to do is point the location where you wish to save your password so that at the time of decryption, you can point to that location to retrieve password. Choose your favorite free file encryption software from the described categories, to prevent unwanted access of your confidential files and data. 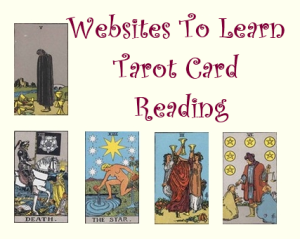 Drop your suggestions and feedback in the comments section below.